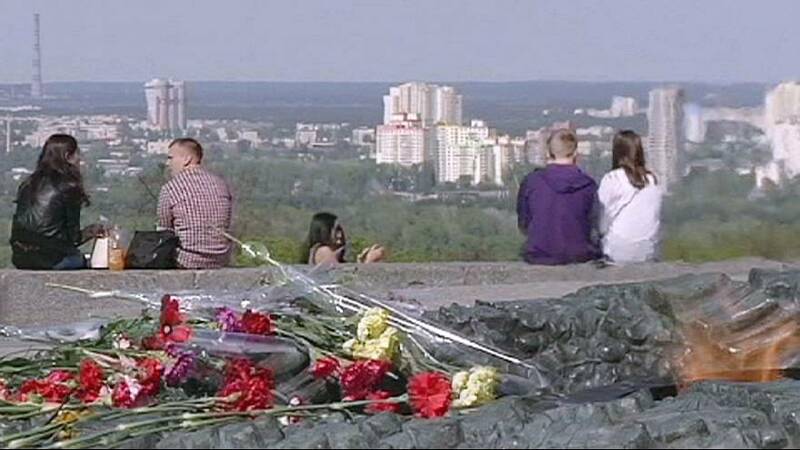 Ukraine is changing the way it commemorates World War II, as euronews correspondent Maria Korenyuk reports from Kyiv. “For the first time in Ukraine’s history, May 8 has become the Day of Remembrance for World War II victims. According to historians, during those years Ukraine lost about 5 million soldiers and 4 million civilians,” she said. War in Ukraine is very much part of the present, not just the past. This year the country is adopting the poppy to remember the victims of World War II. Using red tissue, and with scissors and needles in their hands, a group of women are busy at work sewing them. Poppies were initially adopted as remembrance symbols by the United States and then by the United Kingdom, Canada, Australia and New Zealand to commemorate the soldiers killed in World War I. “We’re becoming part of Europe, and they widely use this symbol. How I wish everything was fine right now, how I wish there was no war in Donetsk, in Luhansk,” said one woman in Kyiv, emotion in her voice. Until now Ukraine celebrated Victory Day on May 9, as in Russia. Now the main commemorations are taking place the day before, marking the end of World War II in Europe in line with other European countries. The poppy is also a counter-symbol to the St George’s Ribbon that Russia uses as a military decoration. A website has been created by the Ukrainian Institute of National Remembrance, where people can tailor personalised poppies in memory of their own relatives who died between 1939-1945, indicating the victims’ names and the date of their death. For those behind the initiative, ever present in their minds is the current situation in eastern Ukraine. “Now, with the war in the Donbas region going on, when we see all its horrors it’s important to say that war is something that mustn’t be repeated, it’s important to understand that any war is a tragedy and we shouldn’t turn the end of any war into some kind of war cult,” said the institute’s director, Volodymyr Vyatrovych. This year tens of thousands of poppies are being given away. In future the plan is to sell them and use the proceeds to maintain the graves of Ukrainians who died in World War II.